I might have previously mentioned in this blog that if there is one job that I wanted to do, it is to be a bartender in a local bar. It was a big dream when I was in College - to be a bartender in TGIFriday's. I wanted to wear those suspenders, cover my uniform with pins and wear the silliest hat, and probably sing Happy Birthday to guests. How fun it is to be paid for something that you love doing? It was a dream that was never realized. I ended up as a barista instead - which is so much like a bartender, except that, I made coffee not cocktails - and there was no throwing of bottles involved. Last week, I met amazing, talented bartenders from TGIFridays as welcomes the summer with new bar menu. And please expect a great show. Click Read More to see some action.. Okay, I failed in taking pictures.. so I will let the video share the stories, action and flair-work. And I say, don't play with fire, unless you are as good as these guys..
During the event, TGIFridays and Stolichnaya Vodka even gave away prizes and goodies. I was too shy to join the contest. Maybe next time ;) But just in case it might be asked in the next event, Stoli is the first vodka on space. 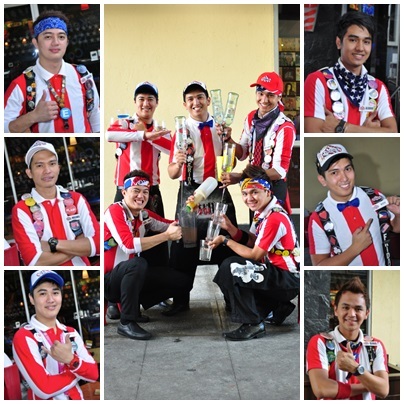 The bartenders are not just the reason to visit TGIFridays - which is the first American casual dining in the Philippines. I remember, hanging out at TGIFriday's Robinson's Place and G3. I feel so old. This summer, TGIFridays offer affordable drinks from beer on tap at Php60, local bottled beer from Php125, and beer by bucket at Php350. My favorite - cocktails, start at Php125 which includes staples like Long Island Ice Tea, Bahama Mama, Kamikaze, etc. Plus, there is even refillable Mojito at Php295. Who can complain? 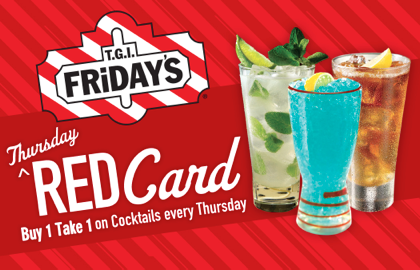 But wait, there is more, The TGIFriday's Red Card will be available by first week of April. It is like a passport for buy-one-take-one cocktails every Thursday. We were one of the first to receive the card, and if you want one - go dine in at TGIFriday's and your bartender will distribute it for free. Yey! And don't be surprised to see this in every TGIFriday's branch.. But to keep a little background, these bartenders went through round of auditions, with most being participants of renowned Shake, Rattle and Pour Bartending Championship which will be on its 18th year in 2013. Oh, reminds me of our Finals Days in College - we have to do bottle flaring and concoct our own drink! So what is your fondest memory at TGIFriday's? !